1) They forget that if God does indeed exist, then they are in no position to judge God. 2) They ignore Christology, which is of utmost importance in any discussion of God. 2. Assume, for the sake of argument, that the God of classical theism exists. 3. Therefore, God is the ultimate authority in the universe." I will call this argument the "Wartick Might Makes Right Argument," or the "WMMRA." "Now those who raise this objection somehow think that they are capable of judging the actions of the ultimate authority in the universe. This is not only irrational, but it is an ultimate show of egoism and haughtiness. There is no such thing as a good argument for humans being able to judge the Supreme Being, if such a Being exists." According to Wartick, if God exists, then we are not able to judge God. "If God does indeed exist, then humans are in no position to judge God and there is no such thing as a good argument for humans being able to judge the Supreme Being, if such a Being exists." If we are in no position to judge God, then NO ONE, INCLUDING WARTICK, can know that Christology is of utmost importance in any discussion of God. This shows that Wartick has no justification for 2. Worst yet, throughout the article, Wartick expounds on what he knows about God which requires judgements about God! "Here we have a perfect example of the truth of God’s Word: “The mind of sinful man is death, but the mind controlled by the Spirit is life and peace; the sinful mind is hostile to God. It does not submit to God’s law, nor can it do so. Those controlled by the sinful nature cannot please God.” Romans 8:6-8. Indeed, when man is in sin, he is hostile to God. He doesn’t simply misunderstand or misinterpret God, but he is hostile to God." For Wartick to claim, "Here we have a perfect example of the truth of God’s Word," requires that he has made a judgement about God, for how else does he know we have a perfect example of the truth of God's word, when he is in no position to judge God at all? If he is in no position to judge God, then he is in no position to judge the word of God! He is therefore, in no position to judge the truth or falsity of God's words, or even if the words came from a God at all! Based on Wartick's statements above, he is in no position to judge whether anyone misunderstands or misinterprets God, or whether anyone is hostile to God. Wartick's claim that, "If the God of classical theism exists, then He is sovereign (i.e. the ultimate authority in the universe)" is also ruled out because to say God is sovereign requires the judgement, that, well, God is sovereign-- when Wartick claims that we are not in a position to judge God! Wartick also claims that, "Christ is to be understood as the interpretive principle for all of Scripture. Every verse should be understood in light of Christ, who is to be at the center of all theology." Now, what Wartick claims about Christ requires several judgements about God. One judgement is that God has made Jesus interpretive principle for all of Scripture and the center of all theology. The majority of Jews however, have judged of God that he NEVER made Jesus interpretive principle for all of Scripture and the center of all theology. (And the OT is first and foremost a religious text written by, and for, the Jews.) According to Wartick, if humans are in no position to judge God, then no one, including Wartick, can judge that Jesus is the interpretive principle for all of Scripture and the center of all theology. According to WMMRA, since God is the ultimate authority in the universe, then it is God who judges what is right and wrong--not us. Consider this analogy. The head of Ford is the ultimate authority over Ford. He judges that the Ford Pinto is a good car even though he knows that the gas tank is susceptible to catching on fire from low speed rear end collisions. He also knows that this will lead to a significant number of deaths, but judges that the loss of life is more cost effective than doing a call back and installing rubber bladders in a Pinto fuel tanks. Well now, this must be right for Ford, because the ultimate authority over Ford judges this to be right. Well, it turns out that it was not right for Ford--they lost money! Ah, I sense an objection coming. That's because the head of Ford is the head of Ford and not the head of the U.S., or the universe. But if he was, then it would be right that so many people, most of which were children, burned to death in the back of Ford Pintos because the ultimate authority said it was right. How absurd! Also, in this case we would have no standard for claiming God is right, or that God is good. At any rate, remember that Wartick is in no position to judge that God is the ultimate authority in the universe, nor is he in a position to judge God's judgement of what is right and wrong.--worse yet, he has no way of even judging that it is God's judgement, or Moses' judgement, or Manu's judgement, and so on! Below, I have paraphrased Wartick's argument to prove how silly it is, and how it begs the question, for if it does not, then below, I have proved Brahma is god, and Christology and Christianity is false! Let's assume that the Hindu conception of god is right. Now, given the Hindu conception of god, we KNOW and therefore have proved that Christology and the Christian conception of god is false! See how that goes. Since humans, including Wartick, are not in a position to judge Brahma, then Christians, in particular Wartick, betray their complete lack of knowledge about the Upanishads/Bhagavad Gita, Brahma, and the universe. 1) They forget that if Brahma does indeed exist, then they are in no position to judge Brahma. 2) They ignore the Upanishads/Bhagavad Gita-ology, which is of utmost importance in any discussion of Brahma. Furthermore, In the first place, those who attack Brahma's morality seem to be forgetting a rather obvious point: if Brahma exists, then we are certainly in no position whatsoever to judge whether Brahma is moral or not. Let us assume for a moment that Brahma of classical Hinduism exists (i.e. omnipotent/omniscient/omnibenevolent/necessary/sovereign/etc.). 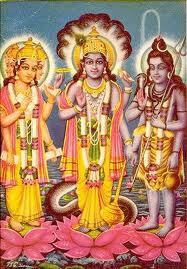 If this God exists, then it seems blatantly obvious that it is Brahma who judges what is right and wrong, not us. It’s honestly baffling that anyone could miss this point, but I’ll try to make it more clear. 3. Therefore, Brahma is the ultimate authority in the universe. Now, those who raise this objection somehow think that they are capable of judging the actions of Brahma, the ultimate authority in the universe. This is not only irrational, but it is an ultimate show of egoism and haughtiness. There is no such thing as a good argument for humans being able to judge Brahma, the Supreme Being, if such a Being exists. I could continue, but I think that is more than enough to prove the absurdity of Wartick's argument, and his line of reasoning. If we have an ultimate authority, call her Gaia, we can still ask the question, "Are actions right or wrong because Gaia says they are, or does she say they are right or wrong because they are?" This is a difficult distinction, and people often get it wrong. "Consider that when an umpire says, "You're out!" the batter is thereby made out. There may be some fact in the world that we can appeal to and say the videotape shows the umpire made a mistake, but the baseball fact is that the batter is out. This is what goes into the official record book. It becomes a fact that the batter was out, and the judgement of the umpire brings that baseball fact into existence. There is a positive reason to suppose that moral notions, even if brought into existence by God, apply independently of God's judgement once they exist. To see this let us use the moral notion good. We say of people that they are good, not that they are right or wrong. "Socrates and Martin Luther King were good people," is and example Religious people want also to say that God is good, indeed the best thing there is . If the view that God brings moral facts into existence by his judgement is correct, however, what this claim comes to is that God had judged of Himself that He is good. Religious people, though, want to say that it is God himself who is good, not that he becomes good only because of a self-judgement. If it were a self-judgement, then, after all, God could be the creature some suppose exists, namely a being who is evil incarnate. Were the universe to be run by a being whose aim is to cause the most suffering--as God's is to minimize suffering--and that being were to say of himself "I am good," then he would be good. He would be good if we accepted the theory that the good of a being is created by the judgement of whoever created the universe. But, this is clearly not true. This being who is evil and not good does not become good by a self-pronouncement. To prevent this absurdity in our conceptual framework, we must reject the view that leads to it. The view that leads to it is that things are good because a being judges they are good. Wartick is one of the Christians as described above. He cannot have it both ways. We are capable of making such a judgement of an ultimate authority, or we are not. If we are not, then to say that god is good, as Christians claim, would be meaningless. My post is a result of teaching this subject using the above information, and our discussions that had been generated in class. The end result was a paper that I presented on this subject.